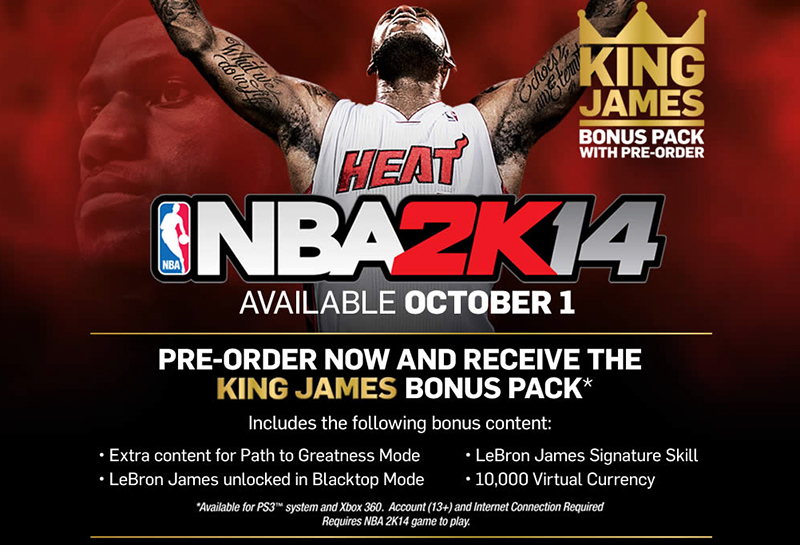 The King James Bonus Pack contains several upgrades to the NBA 2K14 experience, exclusive to Xbox 360 and PlayStation 3. This VC will be added to your VC total, and can be spent on any items where VC is used. To equip the Lebron James signature skill, Load your MyCareer file. In the MyCareer menu, go to Player --> Equip Upgrades. Select an available Signature Skill Slot, and scroll down to the bottom of the list. It is listed as "Lebron Coast to Coast." After redeeming your code, Lebron will be available to play as (or against) in "NBA Blacktop" mode. Players will experience two dream sequences during the Path to Greatness story progression that allow them to play as the Heat versus two different classic teams.